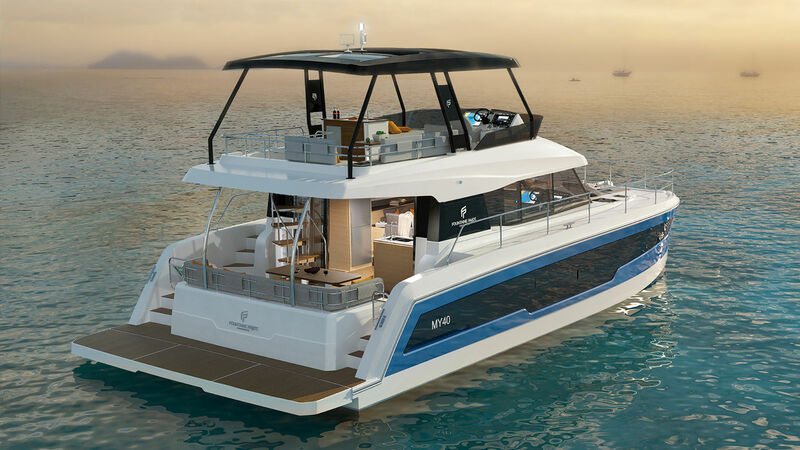 Fountaine Pajot's Motor Yachts branch, which is riding on the success of the 37 and 44, is now offering the MY40. 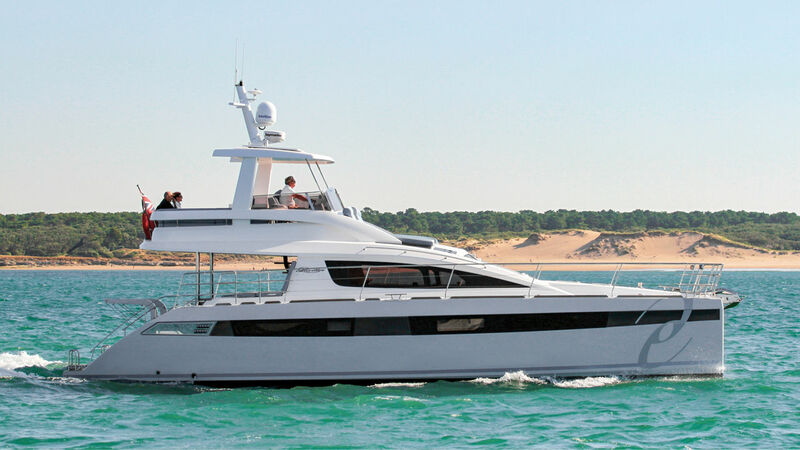 The design is of course more contemporary and dynamic, with recessed topsides and stepped bows. 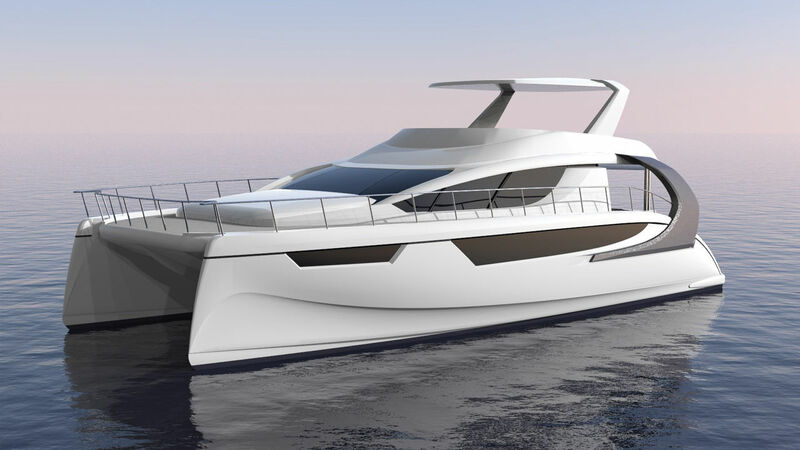 The flybridge looks particularly roomy with a lounge space, sunbathing area, the essential helm station, and a small galley. A forward cockpit adds to the exterior space. From the inside, the 360° view means that the helm can be manned from a sheltered spot, within earshot of the rest of the crew. The lovely galley provides the transition to the large cockpit, which itself opens up onto a large optional aft platform. The owner's port side suite is well worth a visit, and there are two guest cabins to starboard. Cruising at a moderate speed, whichever Volvo IPS engine you choose, you will get a good range. Check it out at Düsseldorf! Diesel: 2 x 700 l.
Good on the water, comfortable, elegant. Our in-house tester was won over by the newly launched Euphorie 5. (see Multihulls World n°162). The challenge of offering a powered version of the Série 5 seems to have paid off. Apart from a few details, notably in the cockpit, they have used the same layout, especially with the huge owner's cabin taking up the whole width of the central rostrum. As ever with top end products, it is possible to customize, still maintaining the top quality in all the detail, without ever tipping over into ostentatious luxury. Our test concluded that this is a boat with a future. With its futuristic rear arc, and its striking anthracite gray color, there's no doubt that the Xquisite 5 will be immediately recognizable, just like its sailing version older brother. The topsides have been carefully designed, with long windows offering a good view from within the hulls, and there are inverted, modern-looking bows. The deck is prolonged as far as the forward beam, with a large integrated sun-bathing area. As the windage is less critical than on a sailboat, there is a hard top flybridge on the coachroof. We can assume that the quality of the fittings will be in the same vein as the X5 Sail: luxurious, spacious and comfortable. The launch is planned for 2020.